I read a review of this book on Ooobop’s blog, and decided it would be a nice holiday read. It was! 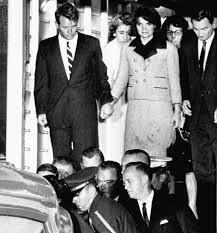 Who would have thought of basing a whole novel around the topic of making a ladies suit, but what a suit, and for what an occasion – Jackie Kennedy wore this one the day her husband was shot in Dallas on 22 November, 1963. The suit, complete with blood stains, has since been boxed and stored for the nation. Amazon reviewers, wanting more on the topic of Mrs JFK or the assassination found it a bit of an odd book, but if you enjoy making clothes this is a luxurious read. It is a work of fiction, based on fact. It covers the story of Kate, an Irish immigrant tailor, who works for Chez Ninon in New York. They buy couture in Paris and then copy it in the States. 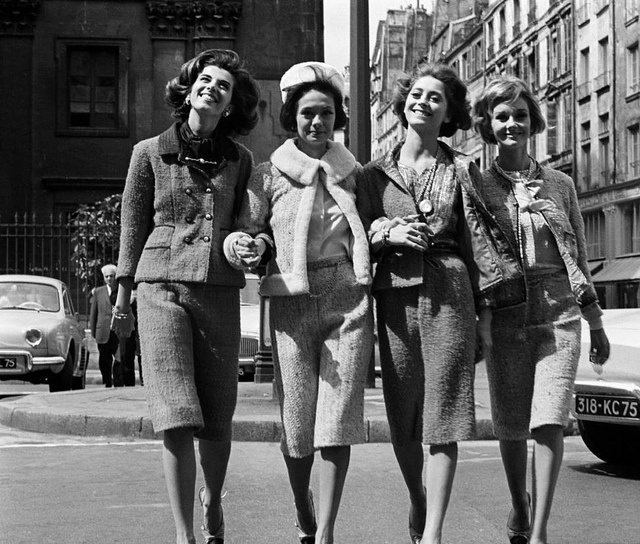 Such was the feeling of the American public (and the garment workers union) against foreign imports that Jackie Kennedy was slated for buying the work of French designers. So the copying was actually endorsed – wearing American made clothes with a Chez Ninon tag – was a political necessity. 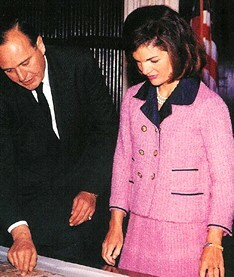 The suit on the left, shown here in a darker shade, is the one Jackie ordered. So this book tells the story of how the toile for this suit came from Chanel, the fabric from Linton tweeds in England (a raspberry boucle) and all the trimmings from Chanel herself. The toile is not just the pattern – it is made up so that the exact “line by line” construction method can be followed exactly. The suit is made entirely by hand, and in this case was fitted on a body double. The story of the hat is also included. The book is also a love story of how the tailor falls for a butcher so you get quite a lot of information on cuts of meat which I could have done without, but otherwise a fine book. I really enjoyed reading about the other “knock offs” that Chez Ninon made for the First Lady and others. Here she is in a copy of a Nina Ricci evening gown from 1961. The original was made up in brown and yellow, but JK’s version was made up in black instead. 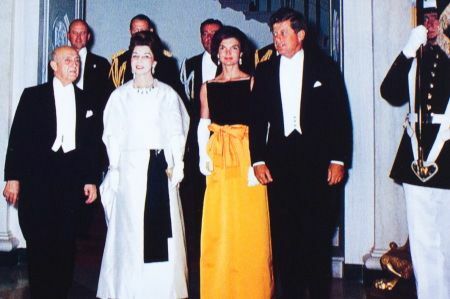 A French site elaborates some of Jackie’s couture choices. It’s a good book, which I recommend. But mostly I recommend having a good look at Jackie’s choices – she really understood what suited her and rarely got it wrong. I think she loved the Pink Suit, and felt really good in it. 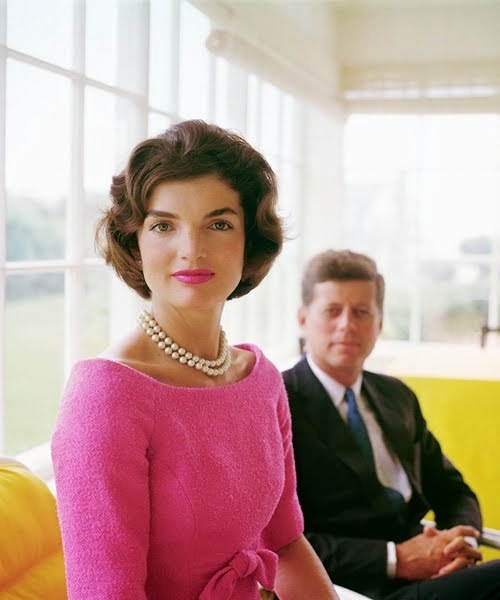 Here is another picture of her in pink – isn’t that the most perfect shade – set off by the yellow sofa and white windows? This picture shows that a great fit and the most flattering neckline, with a good shade of lipstick draws you attention to her fascinating face with her widely spaced eyes. It is almost irrelevant that she is also accessorised with a President. I have read this book too. ( recently) I enjoyed it as well, and could have done without the love story completely……but that’s just me. Ha. What a wonderfully written post Kate……. thanks for the pictures too , they compliment the book perfectly. I also have a book called “What would Jackie Do?” fact-rich as well. Written by Shelly Branch and Sue Callaway – (An inspired Guide to Distinctive Living.) = I recommend reading both in sequence to any one who has not read them yet. Yes I agree that the love story was a waste of space Joyce, and I agree with Stephanie that Jackie looked great in casual too. Positively stunning in that last photo. I had my hands on this book today but passed it up. I will now go back and get it. Thanks for your review.